Up to 25 year Guarantee. DuraTherm Square Chrome Heated Towel Rail. 1958 BTU's heat output. The Square Bar Heated Towel Rail from DuraTherm is a very modern piece of bathroom furniture, as well as being super useful and practical. Towel rails can be used to warm and dry you damp towels whilst still heating up for cold bathroom, this is something an ordinary radiator couldnt do. The modern towel rail which is finished in a beautiful polished chrome that will fit in perfectly with your other contemporary bathroom accessories. Measured at 1600mm tall and 450mm wide this stunning towel rail is the perfect size for your average family bathroom. Being wall mounted also means that it wont take up any floor space. This towel rail will also allow for plenty of space to hang all of the familys towels - no more fighting over the last clean towel. Heated towel rails help to keep your towels feeling softer for longer, leaving them feeling fluffy and soft, ready for the next use. Once installed this towel rail will provide a striking and eye-catching touch for your bathroom. Features and benefits: 1600 x 450mm High quality steel construction Attractive shiny chrome finish A modern and sleek design Wall mounted No of Rails - 29 Heat Output (BTU) - 1958. Towel rail valves not included - Available Here. Complete with a fantastic 10 year guarantee Dimensions: Height: 1600mm Width: 450mm Tube Centre: 410mm. View Our Range Of Towel Rail Valves Here. View Our Range Of Bathroom Accessories Here. 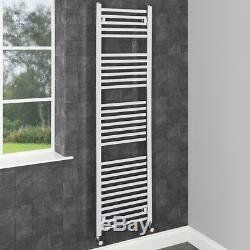 Heated Towel Rail Radiator Bathroom Central Heating Panel Anthracite 1200x500mm. 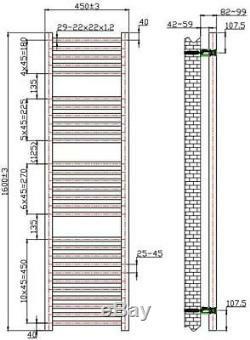 Straight White 1600 x 450mm Bathroom Ladder Heated Towel Rail Radiator. 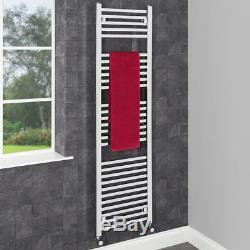 Modern Designer Square Bar Heated Bathroom Towel Rail Radiator Heating Chrome. 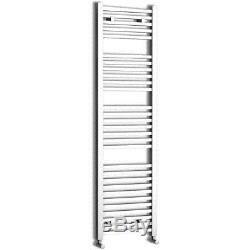 Duratherm Electric Heated Towel Rail Flat Chrome 1000mm H X 500mm W 200Watt. Due to this we ask that you do not arrange to have an installer on site until after your order has arrived and you have checked the goods. We will require photographs showing the presumed faulty item and the issue you are experiencing. Checking goods for damage and notifying us. If someone else is signing for the goods on your behalf you agree to advise them that the goods must be checked and you accept full responsibility for any loss or damage if they sign on your behalf and fail to check. Online Home Retail Ltd Units 2, 3 and 4 Millennium Court Enterprise Way Evesham Worcestershire WR11 1GS. Q - My item arrived damaged, what should I do and how long have I got to report it? A - You can call our customer services team or send a message to us reporting your damaged item. Q - Can I combine more than one item under the same carriage charge? This will mean you only pay one carriage charge. If you pay for each item individually then you will pay carriage for each item. BUT PLEASE DO NOT LEAVE ANY ITEMS UNPAID FOR MORE THAN 14 DAYS, OTHERWISE THIS MAY RESULT IN UNPAID ITEM DISPUTES BEING OPENED AGAINST YOU. Q - Can I collect? Wait for your collection notification. Head to your chosen store with your collection code and collect your parcel its that simple. Your parcel will be held in-store for up to 7 days from when we notify you. Q - Can I make you an offer for an item? A - We do not accept offers for single items as we strive to offer the UK's most competitive prices in the first place. Q - Can I pay by cheque or bank transfer? Cramer Fugi 5 Piece Grouting & Silicone Profiling & Applicator Tool Kit in Box. 9.5kW Triton Aspirante Brushed Steel Electric Shower Modern Bathroom ASP09BRSTL. Triton Electric Shower AS2000XT Thermostatic Power Aqua Sensation TAS2000XTHM. Franke CM/IN White Drainer Basket 112.0050.236. Modern Chrome Bathroom Sink Twin Taps Bath Filler Shower Mixer Basin Mini Mixer. Thermostatic Shower Mixer Square Chrome Bathroom Exposed Twin Head Valve Set. Mira Sport Electric Shower 9kW Power White & Chrome 1.1563.003. So whether you want to spruce up an old, tired looking bathroom or even if you want a full suite for a complete refurbishment, our comprehensive range of luxury furniture and accessories will ensure you can find what you want. Whether you want your bathroom to be designed for a splash and dash in the morning or whether you want to have the luxury of a tranquil home spa experience waiting for you when you get home. Were confident that Plumbworld can help you create the bathroom of your dreams. For news and offers, sign up to our newsletter! The item "Heated Towel Rail Radiator Bathroom Central Heating Square Bar Chrome 1600x450mm" is in sale since Wednesday, December 13, 2017. This item is in the category "Home, Furniture & DIY\Bath\Towel Rails". The seller is "online-home-retail" and is located in GB.